Happy to announce that our newest app called “File Manager App” has landed on the App Store and it is doing great! File Manager is the ultimate app to download, organize and view all your files on your iPhone or iPad. It is like the Windows Explorer on your PC or the Finder on your Mac. Always have your important files with you. You can now lock presentation to prevent other users to edit presentations that were created with Presentation Link. Simply tap on the name of the presentation and then on the lock icon and you will be able to password-protect the presentation. 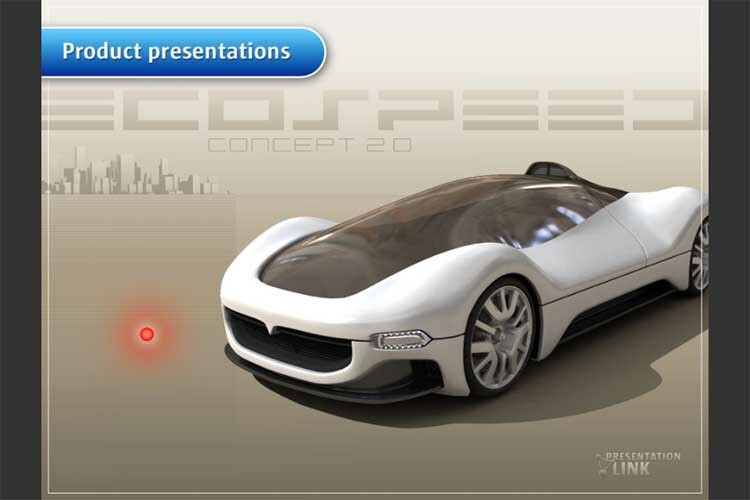 This is ideal for sending your presentation to clients or to your sales force. There are thousands of alarm clocks available on the App Store, but none has the simplicity, functions and style of alarm clock. The clock really focuses on the essentials. With just one touch you can turn your alarm on or off. 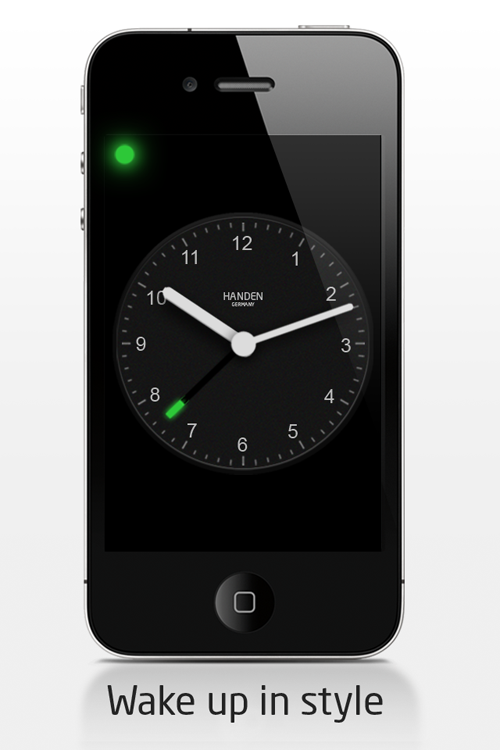 Simply tap and move the green alarm hand in order to set your wake up time. Setting your alarm has never felt so natural. By swiping down with one finger you can dim the screen. This allows for an undistracted sleep at night. Made in Germany to be enjoyed by you! In the coming days our new release 1.4 will be available on the App Store. Presentation Viewer for iPhone is the ideal companion for presentations on the go. Have your presentations at your fingertips. Anywhere and anytime! Presentation Viewer allows you to mash PDF presentations, videos and images into engaging mobile slideshows right on your iPhone. Presentation Viewer is great for showing your presentations on external screens. The new 1.2 release of Presentation Link has incorporated some awesome features including the Kiosk Mode. 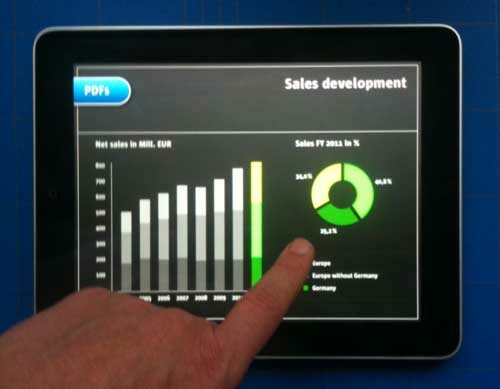 The Kiosk Mode allows you to show your presentations to an audience via iPad stands. The great thing is that users will not be able to leave the presentation mode unless they know the specific gesture of a 2-finger tap for more than 5 seconds. It is ideal for expositions, trade shows or as displays in a show room. You will still need a kiosk mount to cover the home button though. Watch demo video. Being smart and authentic. We love it. The iPad is a great tool for presentations. Some of the advantages are obvious such as portability, the gorgeous screen, long battery life, media capabilities, etc. Others are less apparent, but their impact might be even deeper. The iPad truly offers us a chance to get away from linear, front-facing Powerpoint-style presentations to a more conversational and participative way of presenting our thoughts and ideas. Below you find five tips for successfully presenting with your iPad. Of course the iPad works extremely well as a laptop replacement for speeches in front of a large audience. However, carrying an iPad during a speech can be fatiguing. The strengths of the iPad really comes to play in small groups, for example in seated conference room settings, where the presentation is projected on an external screen, or in occasional presentations for two or three people over lunch. The iPad screen is 1024×768, so you should design your presentation with those dimensions in mind. Make the visual elements of your presentation simple and strong for clearly communicating your message. The same goes for text. Keep it down to as few words as possible. Include media such as videos, images or links to the web that support your message. This is where the interactive capabilities of the iPad really come into play. For presentations on external screens you can use use Apple’s HDMI or VGA adapter. In addition, with iOS 5 you will be able to mirror your iPad screen wirelessly to Airplay ready devices. There are plenty of apps to choose from (see here and here). Presentation Link might be your choice if you like to hold nonlinear presentations and integrate videos, PDFs and web content into engaging interactive slideshows. In smaller groups, the iPad is great to change what used to be a one-way presentation to an open conversation and dialogue. Ask questions and engage dialogue. Also for public presentations, try to make your presentation more real-time and interactive by connecting it to your Twitter stream or collect instant feedback through the integrated surveys. Used in the right way, the iPad will definitely be an ideal companion for bringing your point across. One of the best presentations we have ever seen. Hans Rosling’s talk at TED is truly informative and extremely engaging. When Hans explores trends in health and economics, stats come to vivid life. Also the use of the extravagant pointer is hilarious. Presentation Link team says thank you! We are really thrilled by your support and the great feedback we have received. A special thanks also to our beta testers which provided very valuable advice prior to our launch on the App Store. Thanks so much. The most requested feature so far was a viewer app, which we are currently working on. It should be coming out in the next few weeks. Presentation Link Viewer is a great tool show PDF presentations or view interactive presentations that have been created with Presentation Link’s main app. Please subscribe to the newsletter in order to get updated once the app is on the store.